While following up recommendations for online Museum collections, I accidentally discovered this wonderful site, which I have barely begun to explore. It acts as a portal to many online collections and research materials. The entire UCLA Library Digital Image Collection must be huge (click here to see the Fashion home page), since there are dozens of sites (with descriptions and live links) related to just the site for Fashion and Costume (click here). For a list of accessible fashion magazines and newspapers, click here. Below you’ll find just a small selection of the extraordinary collections you can find through the Digital Image Collection. 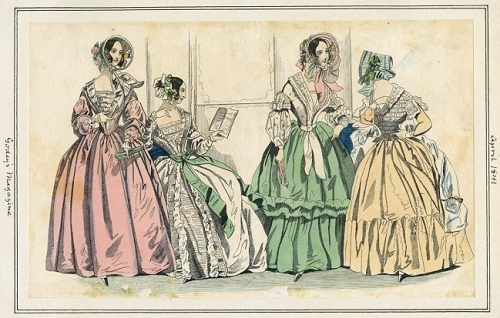 “The Joseph E. Casey Fashion Plate Collection at the Los Angeles Public Library contains over 6,200 handcolored fashion plates from British and American [and other] magazines dating from the 1790s to the 1880s. All of the plates are indexed and digitized for online viewing.” It includes thousands of dated images from early 1800’s sources, including Ackerman’s Repository, Godey’s Magazine, Ladies’ Museum, Ladies’ Magazine, La Belle Assemblee, Petit Courrier des Dames, and many, many more. 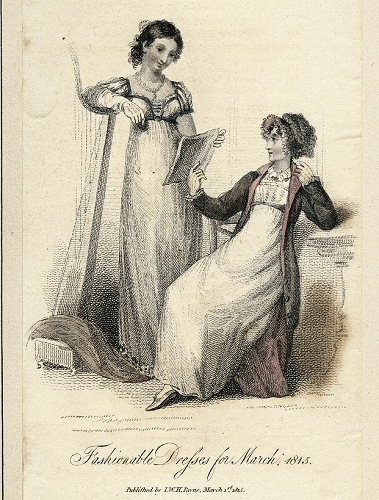 Fashions for March, 1815; image rbc0500 in the Casey Collection. 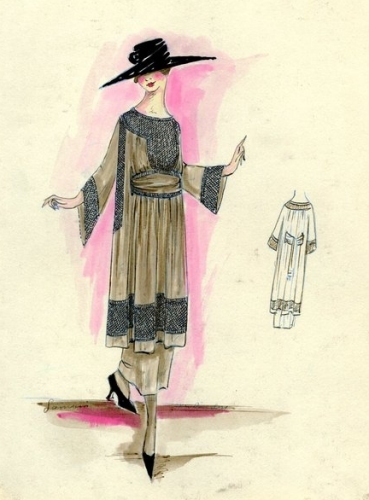 A typical digitized sketch from the Bendel collection: Design by Lanvin, 1917. 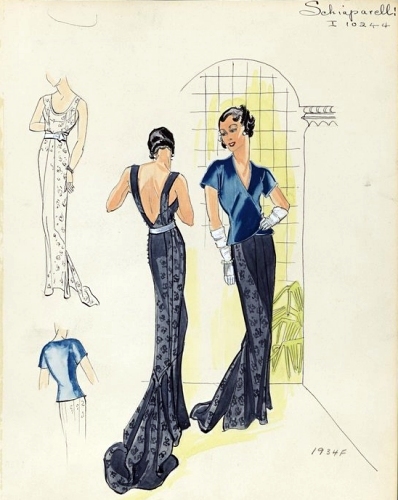 Image from the Henri Bendel Collection online; Schiaparelli, 1934. Lovers of Bonnie Cashin designs will enjoy the photos and design sketches of many of her classic coats, knits, etc. (Click here.) The images are under copyright, but you can see a sample sketch for a characteristic tweed coat by clicking here. If you searched a little longer, you could probably find a photo documenting the finished coat. This is a huge archive. The collection is searchable, (and images are under copyright) but this link will take you to the Galleries page — which includes slide shows of Bonnie Cashin clothes and Villager Sportswear textiles! Click here. I will add some of these links to my sidebar of “Sites with Great Information,” so they will be easy to locate in the future. But first, I’m going take a coffee break and read a copy of the French Vogue, February 1921 (click here) thanks to the UCLA Library’s Digital Image Collection!